12 | December | 2014 | You Are Not the Only One Ministries and Consulting Services Inc. The story of sin begin in the Garden of Eden. Now the serpent was more crafty than any of the wild animals the Lord God had made. He said to the woman, “Did God really say, ‘You must not eat from any tree in the garden’?” The woman said to the serpent, “We may eat fruit from the trees in the garden, but God did say, ‘You must not eat fruit from the tree that is in the middle of the garden, and you must not touch it, or you will die.’” “You will not certainly die,” the serpent said to the woman. “For God knows that when you eat from it your eyes will be opened, and you will be like God, knowing good and evil.” When the woman saw that the fruit of the tree was good for food and pleasing to the eye, and also desirable for gaining wisdom, she took some and ate it. She also gave some to her husband, who was with her, and he ate it. Then the eyes of both of them were opened, and they realized they were naked; so they sewed fig leaves together and made coverings for themselves. What was the Atonement for the sin committed in Eden? “In fact, the law requires that nearly everything be cleansed with blood, and without the shedding of blood there is no forgiveness of sin.” (Hebrews 9:22). “For all [ all of mankind-since Adam and Eve; since the flood even] have sinned and fall short of the glory of God” (Romans 3:23). “For the wages of sin is death, but the gift of God is eternal life in Christ Jesus our Lord” (Romans 6:23). This is where it become exciting everyone. Man was redeemed! For to us a child is born, to us a son is given, and the government will be on his shoulders. And he will be called Wonderful Counselor, Mighty God, Everlasting Father, Prince of Peace. Of the greatness of his government and peace there will be no end. He will reign on David’s throne and over his kingdom, establishing and upholding it with justice and righteousness from that time on and forever. The zeal of the Lord Almighty will accomplish this (Isaiah 9:6-7). Why was this child born? He is the atoning sacrifice for our sins, and not only for ours but also for the sins of the whole world (I John 2:2). See, my servant will act wisely; he will be raised and lifted up and highly exalted. Just as there were many who were appalled at him his appearance was so disfigured beyond that of any human being and his form marred beyond human likeness so he will sprinkle many nations, and kings will shut their mouths because of him. For what they were not told, they will see, and what they have not heard, they will understand. (Isaiah 52:13-15). 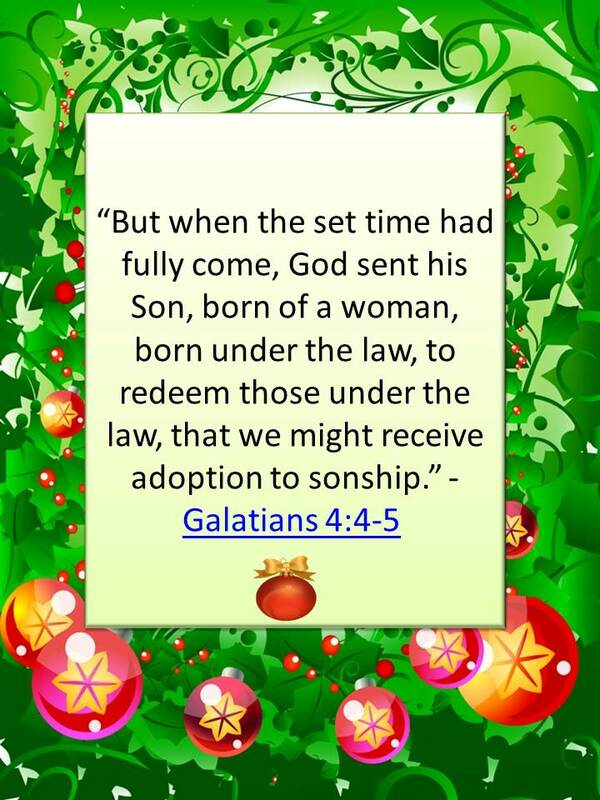 Sin is the reason for this season; the sin of our forefathers and our own sins. But, remember that Jesus Christ came as the perfect gift. He offers you that perfect today. He offers himself to you as the priceless Christmas gift. The best Christmas gift that you could ever receive is salvation. He offers it to you freely. Will you accept it? If you do then say this prayer, and ask him into your heart? “Lord Jesus I have sinned and I ask you to forgive me of my sins. I accept you as my Lord and Savior. Come into my soul and accept me as your child. Amen!” After you have said this prayer, click the contact us button and let us know. We will locate a church for you so you can grow in the knowledge of your Lord and Savior Jesus Christ. 16 In the case of a will,[d] it is necessary to prove the death of the one who made it, 17 because a will is in force only when somebody has died; it never takes effect while the one who made it is living. 18 This is why even the first covenant was not put into effect without blood. 19 When Moses had proclaimed every command of the law to all the people, he took the blood of calves,together with water, scarlet wool and branches of hyssop, and sprinkled the scroll and all the people. 20 He said, “This is the blood of the covenant, which God has commanded you to keep.”[e] 21 In the same way, he sprinkled with the blood both the tabernacle and everything used in its ceremonies. 22 In fact, the law requires that nearly everything be cleansed with blood, and without the shedding of blood there is no forgiveness. 23 It was necessary, then, for the copies of the heavenly things to be purified with these sacrifices, but the heavenly things themselves with better sacrifices than these. 24 For Christ did not enter a sanctuary made with human hands that was only a copy of the true one; he entered heaven itself, now to appear for us in God’s presence. 25 Nor did he enter heaven to offer himself again and again, the way the high priest enters the Most Holy Place every year with blood that is not his own. 26 Otherwise Christ would have had to suffer many times since the creation of the world. But he has appeared once for all at the culmination of the ages to do away with sin by the sacrifice of himself. 27 Just as people are destined to die once, and after that to face judgment, 28 so Christ was sacrificed once to take away the sins of many; and he will appear a second time, not to bear sin, but to bring salvation to those who are waiting for him (Hebrews 9:11-28).